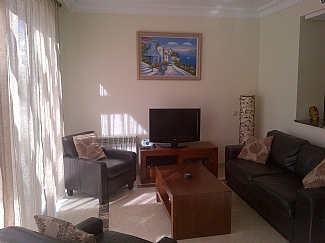 Roda Golf Villa with Disabled Access to lower ground bedroom. This property is also ideal for young children as it has gates, cots highchairs etc please check with the owner when booking. 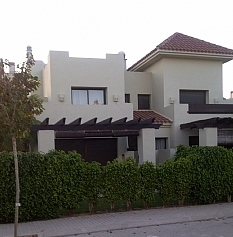 Ideally located within the private gardens with only a 20 minute walk to the beaches of the Mar Menor. This villa can sleep 6 people comfortably and has a lovely shared pool on roda golf & beach resort . I offers Wifi for those who need to keep in touch during the vacation. Only 10 minutes from Murcia's San Javier airport and the close by to beautiful safe sandy beaches of the Mar Menor. Close to the resort is a shopping centre in Los Alcazares with a good selection of bars and restaurants. Roda is home to the first PGA golf academy in Spain and is an ideal resort to take golf classes in the sun. 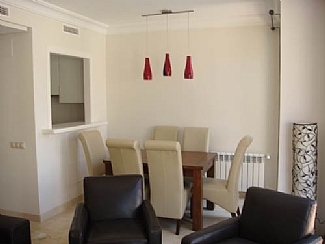 It is suitable for families as well as golfers and makes a great holiday break. 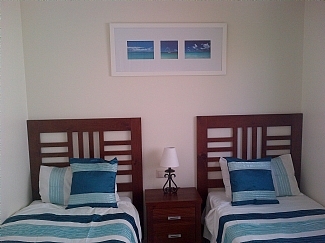 Bedroom 1- double room with a king-size bed, bedside tables and fitted double wardrobe. Bedroom 2- twin room with single beds, bedside table and fitted double wardrobe. Bedroom 3- twin room with single beds, bedside table and fitted double wardrobe. kitchen has high quality marble floor and work surfaces. All modern conveniences like cooker, hob, fridge-freezer, microwave, dishwasher, kettle, toaster, iron, ironing board, and clothes airer. Cutlery, crockery, glasses, cookware and plastic ware. living room - is stylishly decorated with a brown leather sofa and two armchairs, coffee table, extending dining table and 6 cream leather chairs. There is a flat screen TV with English as well as Spanish channels. 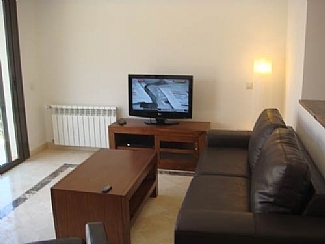 This property has easy access - with parking facilities outside the door for two vehicles. 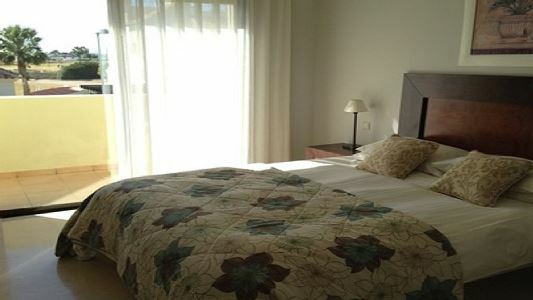 The villa has a downstairs bedroom and bathroom which makes it amenable for disabled access. The living room is stylishly decorated with a brown leather sofa and two armchairs, coffee table, extending dining table and 6 cream leather chairs. Internet and satellite TV, including Sky, Sky sports, BT sports. DVD player and MP3/Ipod docking station. A cot and highchair, laundry services, airport pick-ups and a selection of welcome packs can be provided by our management company if requested. 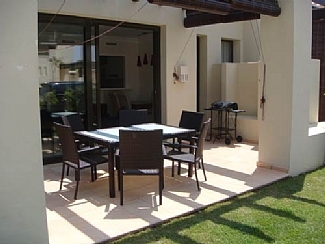 Outdoor dining area for 6 on patio with barbecue and four sun loungers. Storeroom with additional 6 sun beds and parasols for the beach. 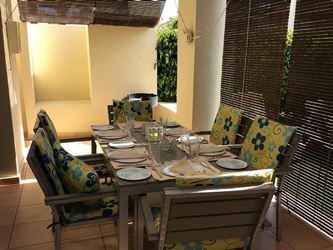 Outdoor dining area for 6 on patio with barbecue and four sun loungers. Storeroom with additional 6 sunbeds and parasols for the beach. 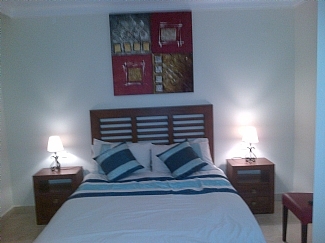 A wonderful luxury 3 double roomed accommodation sleeping 6 people with ease. 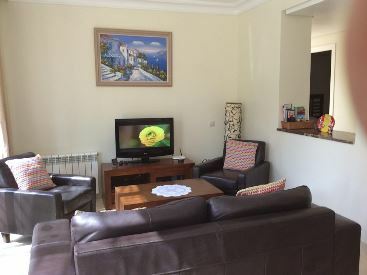 .Along with the long list of baby gear provided, the villa comes with: SKYTV, DVD player, CD player, Ipod docking station, internet access, oven, hob, fridge-freezer, washing machine, clothes drying rack, dish-washer, microwave, toaster, kettle. 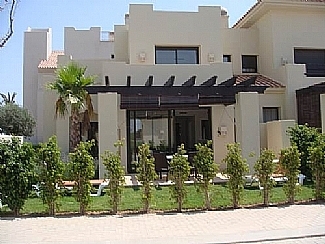 This is a luxury house on an all year round resort fitted with climate control air conditioning and gas central heating. The property overlooks one of the three large swimming pools.